Package Contents “Record,” “View,” and “Analyze” driving with HKS’ drive recorder DMR. DMR is now one seg and DTT compatible. Some drive recorders generate radio wave, which causes the electromagnetic interference of digital terrestrial broadcasting, which results in poor or no signal reception. HKS DMR minimizes radio emission with radio shielding on the main unit and other components! HKS DMR can record driving and allow digital terrestrial broadcast viewing at the same time. Depending on signal reception/ radio wave conditions, digital terrestrial broadcasting may not be received properly. Position the DMR unit at the top of the windscreen, and just plug into the Cigar Lighter Socket. Location and interval speed can be viewed on Google maps using the GPS location information. ・G sensor can detect and record the speed (G) so the DMR can show the XYZ amplitude. Also, there is a permanent power supply unit include which prevents the battery from discharging too much. 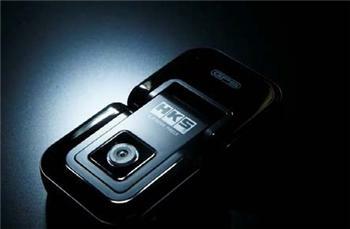 HKS’ DMR is equipped with the 2nd camera as a standard. The camera can point towards the driver’s foot or meters to record the driver during circuit. Using the special viewer software, it is possible to analyze your driving more precisely.